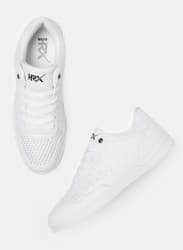 You ll love the comfort and style of these super modish casual shoes from HRX by Hrithik Roshan. Style this white pair with dark denims and a graphic tee for a chill look for the weekend. Package Contents 1 Pair Of Sneakers Shoe Care Surface Dirt can be cleaned with a good quality brush or a damp cloth.